Chris Gibson - The Natural Expert: An End In Sight For Acne Prone Skin? An End In Sight For Acne Prone Skin? I hope everyone had a terrific weekend! It was a busy weekend in the garden for me and my friends. The organic things we are growing are getting closer to being ready for harvest. I can't wait. Even the apples are looking good even though they are still a month or so away from being ripe. 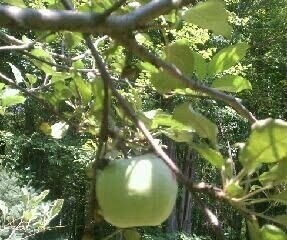 Here is a picture I just took of the apples. Like good food is integral to the health of your body, good skin care habits are integral to the health of the skin, especially problem or stressed skin. You know I try to keep my posts to subjects based on what I'm asked on my Facebook fan page and on this blog. I wanted share some good questions from some of you and my answers. Especially when it comes to dealing with acne prone skin. It is really a big problem for a lot of people. I think you will find these universal skin questions and the answers helpful to you. WOW, thank you for your great questions about acne and blemished skin. While I have answered these on the Facebook fan page itself, here is an overview of what to do with acne prone skin. I have written about these tips previously, but since so many of you are asking I'm sharing them with you again. Acne prone skin care routines need to be kept as simple and natural as possible in my opinion. Acne prone skin is sensitive skin! This is a big subject, so big I wrote a best selling book on how I overcame my own 15-year case of it. What I'm going to do here is outline the best general skin care routine if you are prone to breakouts, or like I dealt with the "full out - never wants to leave" acne. The first part of any acne fighting regimen should involve gently cleansing the skin to remove dirt, excess oil, and other irritants without over stripping the skin. Choose a mild cleanser that is perfume-free and most importantly soap free, which means the product won't block pores. I suggest glycerin-based like the Ginale Purifying Facial Cleanser that includes a foaming face wash for this purpose. 1. Only Cleanse Your Face Twice Daily. Don't wash the skin more than twice a day and don't scrub your skin, because these actions could lead to further irritation and even more breakouts. 2. Be Sure To Cleanse All Areas Of The Body That Are Affected By Acne or Could Be Affected By Acne. In addition to the face, acne may also appear on the chest, back and buttocks, and these areas can be cleansed the same way as the face. I often recommend the use of a special sponge made by 3M corp called a Buf-Puf. It is a special sponge that will gently help exfoliate the skin better than any harsh chemical can. Glycerin based face washes that contain alpha hydroxy ingredients are also good to use. 3. You Should Be Wary Of The Use Of Chemically-Based Astringents, Masks, or Toners. These products promise to remove excess oil left after cleansing, but they can irritate the skin. If you decide to use one of these products, choose one that's alcohol-free so it won't irritate the skin. We created one in the Ginale line that works extremely well for this purpose. 4. Always Use A Oil-Free Moisturizer and Stay Away From Any Moisturizer That Contains Mineral Oil, Lanolin, or Petroleum. Olive, apricot, and tea tree oils in moisturizers are the exception, and can be used. The big myth is to dry out the skin to help with acne and nothing could be further from the truth. A good moisturizer will speed healing of breakouts and help curb oil production of the skin, which the acne bacteria feeds on. By having a gentle and effective skin care routine you will give acne prone skin a chance to find balance and self-heal. This gives you a light at the end of the tunnel for clearing your skin.